An explanation by Richard Dutton Field of Cave Creek. For approximately 5000 years, the question of how the upper 300 feet of the great pyramids of Giza were constructed has boggled the minds of everyone. The mathematical accuracy of the angles, the tremendous height, the decreasing surface on the upper levels which make construction seemingly impossible, not to mention the most crucial element of all, the smooth, polished Tura Limestone covering, all add up to truly make this one of the great wonders of the world. The overall height of the main pyramid is 450 ft. It is generally accepted that the first 150 ft. utilized a single earthen ramp in its construction, which was built up as the lower levels were completed. The next 300 ft. is definitely a quandary. However, if you do the math, you will realize the structure at this point is actually two-thirds complete. Many ideas have been put forth about how the final 300 ft. were achieved, including the assistance of extraterrestrial help. The easiest way of doi ng something is often the simplest. I have spent my time looking for a simple human, yet clever approach that was technologically possible for Egyptians. Measuring can be done with a rope placed in the center of square levels. A circle is easy to create this way. A square could also be monitored with this same method, as the circle would touch the edge of each square, if the correct size. Each plane could be leveled using water as a guide to depict any slopes. The biggest challenge I see, however, are the corners — and I believe they are the clue to this whole mystery. Each corner would need to be sighted to keep these angles accurate as the structure rose. This would mean that each corner must have been available to the builders in order to keep the angle pure; first, with the crude blocks, and then brought into precision with the limestone casing. This sighting had to be done from above, as the work is constantly based on the previous level. The only way to accurately sight the previous level is from above and it had to be a constant guide for the builders. Many ideas have been proposed. The most accepted theory is that the ramp was spiraled around the entire pyramid and the blocks were pushed and lifted into place as they went. There is a new theory out that proposes that the pyramid was built from the inside with inner ramps. My theory proposes that for ease and accuracy of construction, ramps zig-zagged upward on a single side, leaving the four corners available to sight. The edges and other planar surfaces would also be available for accurate sighting. A ramp which spirals around the entire structure would make sighting impossible. 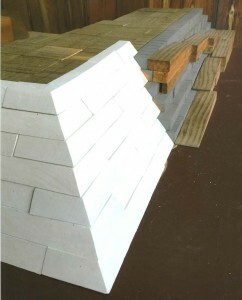 An inner ramp does not explain the perfect, polished exterior. I can see this being achieved to a certain point, but at the highest levels, you lose the ability to sight the corners and sides from outside and above, which would become vital in those last levels. I don’t see this happening from inside out. I believe the secret to the construction is that the ramp was actually built on a foundation of unfinished, protruding Tura Limestone blocks, which are depicted as blue blocks on my model. Once the pyramids were finished on all three sides and all four edges of the corners, the workers would begin a downward dismantling of the ramps and a simultaneous chiseling and polishing of the protruding Tura Limestone blocks, flush to the rest of the plane of that fourth and final side. On my model, you will see white as the finished Tura Limestone casing. The inner crude limestone block is shown as tan. 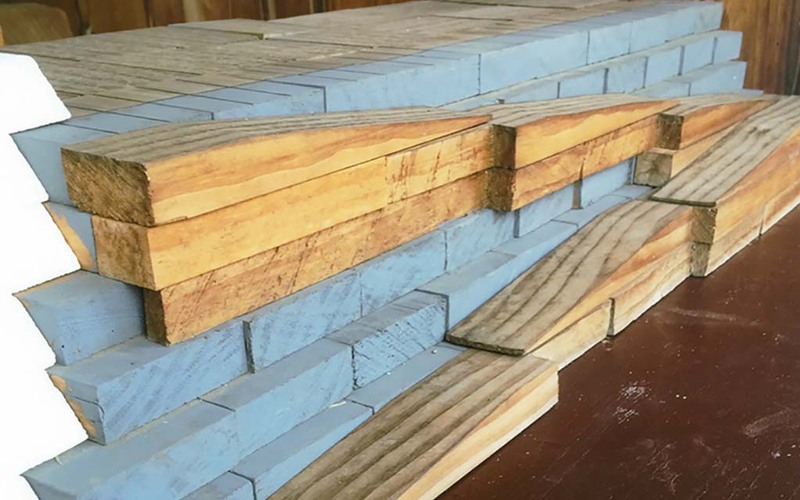 The blue blocks are also Tura Limestone, but colored for clarification as they are the protruding pieces of block over which the ramp was constructed.